If you want to get rid of your coffee, tea and tobacco stains, then Opalescence teeth whitening system should be your first choice. Why? Because it is a revolutionary whitening system gel which provides unmatched, professional teeth whitening results. With a vast range of teeth whitening products, the Opalescence whitening system takes care of all your teeth whitening needs. How Opalescence Whitening System Works? The Opalescent whitening gel consists of a safe and potent bleaching agent like carbamide or hydrogen peroxide. This bleaching agent, when applied to your teeth, releases hydrogen peroxide which penetrates beneath the outer enamel layer of the teeth and dissolves the adherent coffee, tea and tobacco stains. This premium tooth whitening system allows you to get a beautiful smile at the comforts of your own homes. This system is provided in the form of custom-made whitening gels which offer a personalized whitening experience. Opalescence 10 PF - it is the mildest whitening formula which contains 10% carbamide peroxide. It is offered in three flavors, mint, melon and regular. Opalescence 15 PF - this at-home whitening gel system contains 15% carbamide peroxide. It is offered in three different flavors, mint, melon and regular. This system is best if you need to get rid of mild coffee or tea stains. Opalescence 15 is also an excellent choice for people with sensitive teeth. 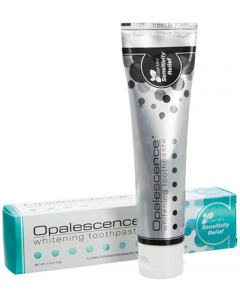 Opalescence 20 PF - this is a premium at-home whitening gel system which contains 20% carbamide peroxide. It also contains ingredients which are helpful in preventing sensitivity after the whitening procedure and ideal for removal of moderate teeth stains. Opalescence 35% PF - regarded as the most powerful at-home whitening formula, this system contains 35% carbamide peroxide gel. The Opalescence 35 PF is the ideal choice for the removal of heavy teeth stains. Despite its excellent efficacy and whitening performance, the Opalescence 35 PF contains ingredients like Potassium nitrate and fluoride to protect your teeth from post-whitening sensitivity. Opalescence GO 15 – With Opalescence GO, you can enjoy a pearly white smile virtually anywhere. This system comes in prefilled, and disposable whitening trays so that you can take them anywhere with you. For best results, you need to wear the whitening trays for at least 15-60 minutes, depending upon the recommendations of your dentist, each day for at least 5-10 days. Provided in mint flavor, you can enjoy professional teeth whitening at the comfort of your home. It contains 15% hydrogen peroxide as the active whitening ingredient. 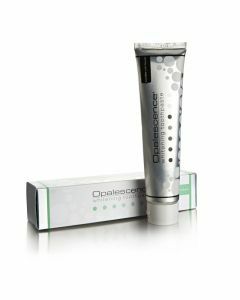 Opalescence Whitening Toothpaste – this whitening toothpaste for maintaining your whitening results after an at-home or professional whitening procedure. This is a toothpaste containing mild abrasive content which removes teeth stains while ensuring that your teeth do not become sensitive. Offered in a mint flavor, it also contains fluoride which makes your teeth stronger and resistant to teeth cavities. Opalescence Sensitivity Relief Toothpaste – This toothpaste is best for maintaining your bright and white smile, while preventing your teeth from sensitivity at the same time. Offered in a refreshing flavor, the formula also contains potassium nitrate which is helpful in preventing teeth sensitivity. To choose which tooth whitening formula is best for you, you should consult your dentist. With the wide range of products offered by Opalescence, you are sure to get a product which exactly matches your whitening needs.